This issue opens with a Medieval-style spread detailing the origin of “Little Alice,” Kate Kane’s criminally insane sister. 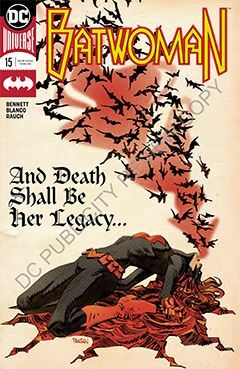 Kate Kane searches for solution to the infected bats the Many Arms of Death (led by her sister) have launched at Gotham City. It’s rather brief story, told with extensive use of two-page spreads using large panels to convey the story instead of text. I believe the current price point for DC comics is $2.99, which in this case is about $2 too much. The entire story seems to take place in less than five minutes. Much of the action in this issue involves Batwoman attempting to lead infected bats away from Gotham. As hero, her confidence seems shaky, and her eventual strategy a long time coming. One might attribute this to her lack of experience alongside someone like Batman, but it has an element of truth to it. I can appreciate that. As for the airships that accompany her, I an uncertain what their general roles are, or where they come from. Fernando Blanco seems to have settled in nicely at the drawing board, though the opening sequence left me a bit cold. I don’t know if that was his idea or the art direction of the writer, but it seems out of place to me. There are several two-page spreads that could have been limited to one, in my opinion. Again, artistic choice or art direction? Who knows? I have enjoyed Batwoman when she has been a supporting player in Detective Comics, but I feel giving her her own title is misplaced. It’s as if DC believes Batman is so popular, that if they place the word “bat” in front of anything, it will sell. In this case, I suspect they are mistaken. I believe Batwoman requires additional seasoning before being worthy of her own book.